Thirteen year old Savyon McKenzie of Toronto, Canada, graduated from Our Lady of Grace RC School on 22nd June 2017. He is the son of Jamaican born Wayne McKenzie and his Vincentian wife Giselle McKenzie. Savyon would be attending the Mary Ward Catholic Secondary School for another four years before going on to University. 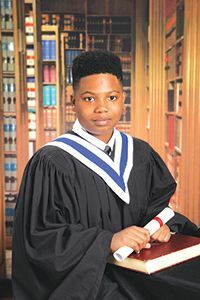 Savyon has his mind set on becoming a lawyer, as he is following in the footsteps of his great uncle Trevor Peters, a retired senior magistrate in Trinidad and Tobago. Congratulations, Savyon. Greetings from your dad Wayne, mum Giselle, sister Sarai, great aunt Roslyn, uncles, grandparents, friends Mr Andrew and Mrs Viola Jacobs, Miss Ina and all your cousins in England, Canada and America. Keep reaching for the stars. We are proud of you.